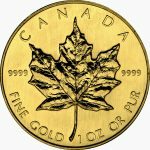 The one ounce maple leaf is the largest standard Canadian gold bullion coin you can purchase. It weighs 31.110 g, is 30.00 mm in diameter, and is 2.80 mm thick. Like all coins in the series, it is .9999 in fineness. 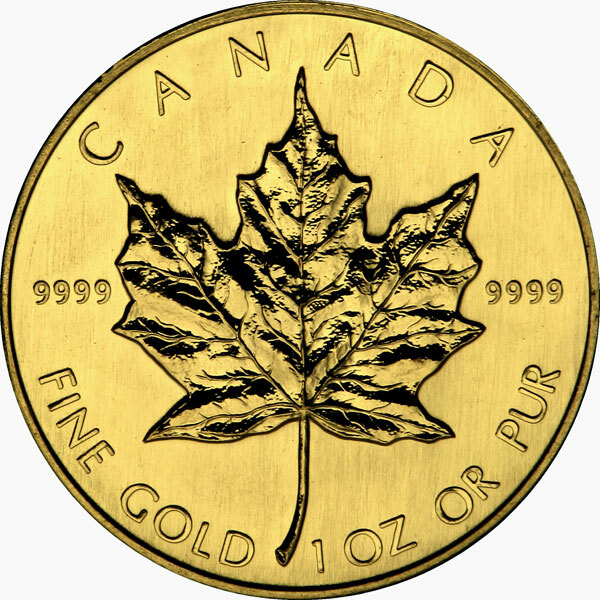 Canada’s official bullion coin is called the Gold Maple Leaf. 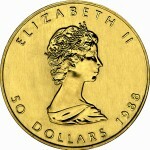 The design (by Walter Ott) was unveiled in 1979 by the Royal Canadian Mint. Before this coin was created, the only other popular gold bullion coin was the South African Krugerrand and it was hard to find. The Canadian Gold Maple Leaf has a purity of 0.999 and contains almost no base materials. The coin is offered in many denominations, sizes and weights ranging from 1/20 oz to 1 oz. On this particular page we have 1 oz Maple Leaf coins for your consideration. 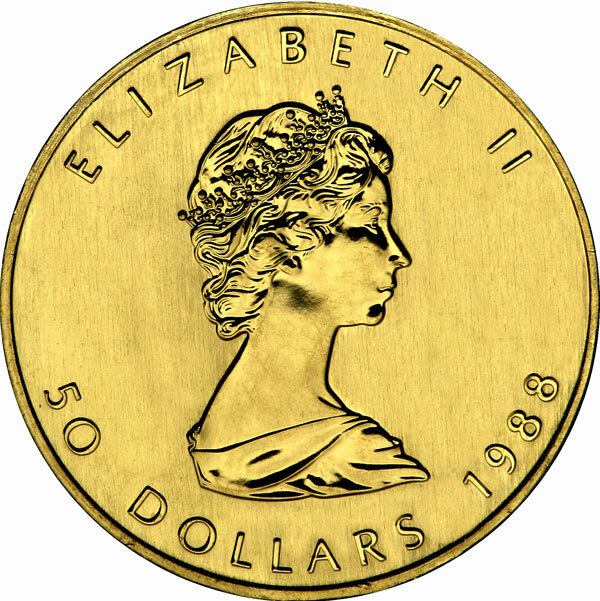 In 1982, the Mint became the first to make a 99.99% pure gold coin. This resulted in the coin getting instant fame in the gold bullion market and it still remains the most recognized and one of the most sought after coins. Collectors and investors alike favor this coin. Since pure gold coins are very malleable, the Maple Leaf emblem on the coin can get ruined if it is treated poorly. Keep it in the airtight package it comes in and you will be fine. The maple leaf design has been around long enough to go through three major revisions to the portrait of Queen Elizabeth II on the obverse. In 2007, the largest Gold Maple Leaf was displayed to the public, which had a face value of one million dollars. This coin is 3cm thick, has diameter of 50cm, weighs 100kgs and has a purity of 0.99999. The coin was designed by Stanley Witten. What began as a publicity stunt to raise awareness about the Royal Canadian Mint’s new line of 0.99999 pure Gold Maple Leafs became something bigger. Public demand for it came as a surprise but the mint obliged and produced four more. In 2013, the Mint introduced a new and unique Security Feature to confirm the authenticity of its GML coins. Derived from the same award-winning security technology applied to Canada’s $1 and $2 circulation coins, the GML Security Feature consists of a textured maple leaf, microengraved with laser technology on a small area of the reverse side (Maple Leaf side) of the coin.